DNR Firearms Safety Certification is required of anyone born after December 31, 1979 to purchase a hunting license in Minnesota. Check requirements in other states. Firearms Safety Classroom Course - currently scheduled classes below. The MN DNR Firearms Safety Hunter Education endorsement can be listed on the back of a Minnesota driver's license or identification card upon request. A MN Hunting License that includes a Firearms Safety Number is sufficient proof of course completion. 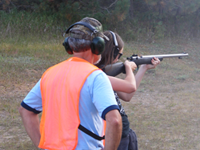 Firearms Safety Online Field Day ~ Female Only! !